Every time, after running a training I say to people: ‘REMEMBER, nerves are a sign of playing a bigger game’! So get nervous, it’s part of growth. Don’t let a week go by feeling comfortable and most importantly, be AWARE of what you are telling yourself. 1. Amy Cuddy’s TED Talk about ‘How Body Language Shapes Who You Are’. Body language affects how others see us, but it may also change how we see ourselves. Social psychologist Amy Cuddy argues that “power posing” — standing in a posture of confidence, even when we don’t feel confident — can boost feelings of confidence, and might have an impact on our chances for success. NOTE: Some of the findings presented in this talk have been referenced in an ongoing debate among social scientists about robustness and reproducibility. 3. ’20 Questions You Should Ask Yourself Every Sunday’ is an additonal powerful measure to keep yourself on track. The process of self reflection helps maintain conscious awareness of where you are at and where you intend to go. It is ever so powerful and helping you to stay on track with your speaking and business goals. 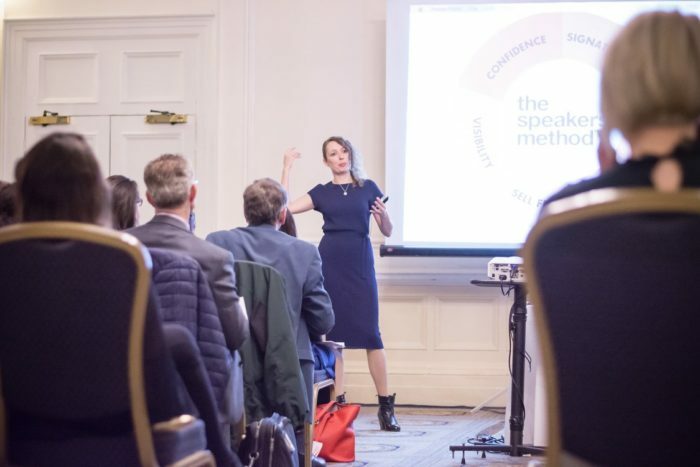 Lastly, the SECRET to your speaking success is getting started AND c o n s i s t e n c y – exactly that has enabled a number of our members to add a zero to their monthly turn-over, getting on a TEDx stage or being signed up by a speaker bureau. Keep the momentum going and join 2,000 other professional & aspiring speakers in the Speaker Express Facebook group here.